The Small Form-factor Pluggable (SFP) Gigabit interface Converter (GBIC) slots on NETGEAR's managed switches provide you with a highly adaptable network. You have the option of building your network for copper and/or fibre gigabit connections. 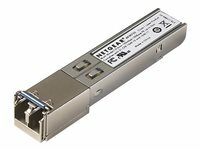 Due to the automatic detection capabilities of the switch, installation of the SFP GBIC only requires that you plug the module into the module slot. 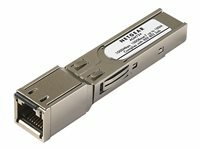 Plugging an AGM731F module will disable the associated RJ-45 port.